“They worshipped him; but some doubted” (Matthew 28:17). That’s not a bad place to begin a sermon on Trinity Sunday. That little phrase from today’s gospel (Matthew 28:16-20) seems to me an authentic and accurate description of what often happens when we approach this God whom the Church tells us is one God in Three Persons. Worship and doubt stand side by side. The Bible we use each Sunday translates the Greek as “some doubted.” However, a more literal translation of the Greek is “they doubted,” and other versions of the Bible translate it that way. It wasn’t just some that doubted, they are all doubted even as they all worshipped. Regardless, the point is worship and doubt are not mutually exclusive. That they doubted doesn’t mean that they had no faith or that they didn’t believe. Rather, they gave their hearts to him but in their heads they couldn’t make sense of or understand what was happening. They were of two minds. Their hearts and their heads were not aligned. Part of the experience made sense but another part did not. The experience was real, the logic and understanding, however, were unable to match the depth and reality of their experience. Who among us hasn’t had that kind of experience? Try to define love or explain to your friend or spouse why you love her or him. Make a list, count the ways: you are pretty, handsome, smart, funny; we have a lot in common; we enjoy the same things; you are fun to be with; you are a good cook; you have a good job; you are a good provider; I am attracted to you; you make me happy; we just fit; I can’t imagine life without you. After a while the list begins to sound shallow and superficial because you know at a deep level that list does not even begin to reflect or adequately describe your love. How can words ever describe or capture the beauty and mystery of two lives shared as one, given to, and received from each other? Can words ever fully describe and explain giving ourselves to another so completely that we live within the other and they within us, neither one losing themselves but each one finding their true and complete self? I doubt it. Words fail. Some things, like love, can be experienced but they can never be fully understood, explained, or defined. Recall a time you were entranced and enlivened by the beauty of a sunset. Warmth enveloped your skin and you felt a presence that hadn’t been there before. Clouds became a kaleidoscope of changing colors. Light sparkled and danced on trees, rocks, the river. How do you explain that? Is it just light rays refracted by dust in the air and affected by the angle of the sun in relationship to you? I doubt it. Surely, that kaleidoscope of color is more than a visible mass of condensed water vapor floating in the atmosphere. Was the envelope of presence that warmed you nothing more than photons hitting your skin? I doubt that too. Some things, like beauty, can be experienced but they can never be fully or adequately expressed. They are always more than the words. Have you ever held in your hands the wonder and mystery of a newborn child? Remember those tiny wrinkled fingers, those specs for fingernails, her hiccups, his beating heart, the soft breath that brushed your cheek with awe. How do you explain that? What words can describe that moment? Sure, we know the biology and physiology of reproduction but we still can’t wrap our heads around it. Is that child simply the end result of reproduction? Is that how we would describe that moment? I seriously doubt that. We don’t look at that little one and see the result of a biological process. In that new life we see and declare a miracle. Those are just three examples of experiences that are bigger, more beautiful, and beyond what our minds can fathom or make sense of. We love and we doubt. We bask in beauty and we doubt. We hold new life in our hands and we doubt. In these contexts doubt is not a deficiency. It’s a declaration that we have glimpsed the divine and touched the transcendent. It’s our recognition that the experience is greater than our words can express or our minds grasp. In the end, the experience is what we most want. It changes and transforms our lives in ways words, explanations, and concepts never will. If that’s true about relationships, sunsets, and babies; love, beauty, and new life; how could it not also be true about God? If the Trinity is about anything it is about love, beauty, and new life. We may not be able to explain this but we know it when we experience it. The how of it all may be beyond our understanding but that does not stop us from seeking it. 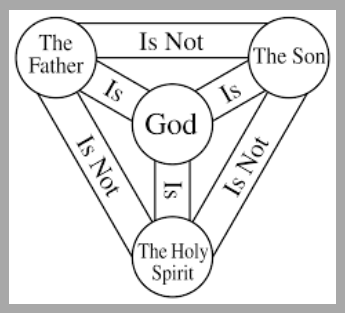 The Triune God is ever calling and asking us to take our place among the Three. 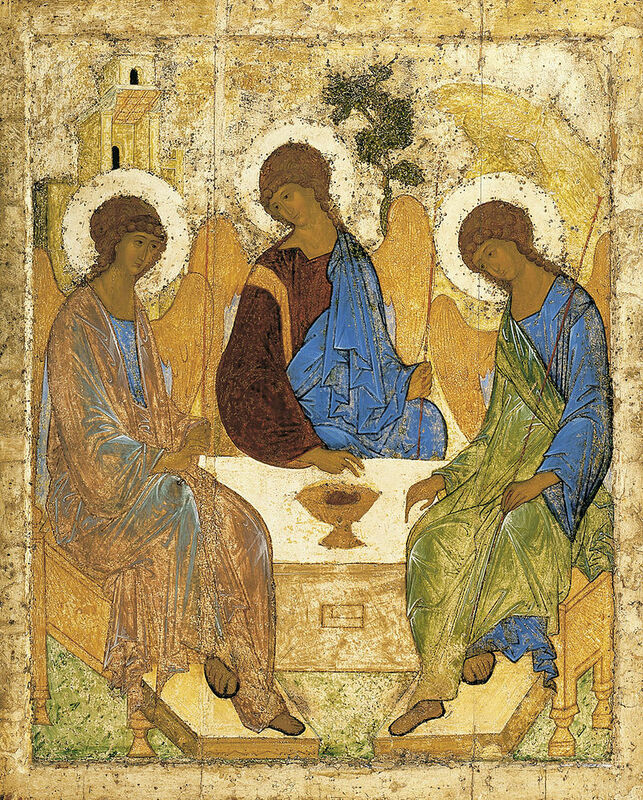 No where is that better portrayed than in Andrei Rublev’s icon of the Holy Trinity. It’s based on the story of the three men who visit Abraham. For nearly seven hundred years Rublev’s icon has been the Church’s attempt to express what cannot be spoken and portray what cannot be seen. Three persons, distinct but not separate. They look just alike though dressed in different colored robes. They share the same expression. Their bodies and postures are alike and form a circle of unity and oneness. Three persons; one life, one love, one beauty. That’s not just about God and the Three Persons. It’s also about us. Notice the empty space at the table around which the Three are gathered. Who might that be for? It’s for us; for you and for me. We are to live our lives with and in the life of God. For it is “In him we live and move and have our being” (Acts 17:28). The Trinitarian life of God is to us what water is to a fish. It is our natural environment and we are already in it. It is ever present, pervasive, all encompassing. Searching for and seeking God, as if God were absent, distant, or apart from us, is like a fish asking, “Where is the ocean?” Maybe that’s why Jesus begins his promise of presence with “And remember.” “And remember, I am with you always.” Remember what already is. So what if we left here today not just remembering the words of Jesus’ promise, but opening ourselves to the experience of that promise? How might that experience change your life? What would you dare, dream, or imagine? What strength, hope, or consolation might come with that experience? What might God do that would cause you, in wonder and awe, to doubt? “Regardless of who you are, what you may have done or left undone, what has happened in your life, where you go, or what you encounter, the promise holds. The presence is real. And it’s not a promise to be realized in the future. It’s a promise that has already been and continues to be fulfilled. “I am with you always.” This was central to my homily at St. Edmunds Church, Oslo. Thank you Fr. Mike. Fr. Julius, it’s good to hear from you. May God bless you, your words, and your congregation. “So what if we left here today not just remembering the words of Jesus’ promise, but opening ourselves to the experience of that promise? How might that experience change your life? What would you dare, dream, or imagine? What strength, hope, or consolation might come with that experience? What might God do that would cause you, in wonder and awe, to doubt? I’ve been doubting a lot recently, but reading this sermon was an experience of presence I’ve longed for more than any proof that God exists. Thank you Elizabeth. I am glad the sermon helped you experience the Presence. I can experience the beauty of nature; be left breathless with the wonder, peace, love, and ineffable-ness of God, and feel profound gratefulness when He shows up in answered prayer. And even as I love those moments I wouldn’t want to experience them 24/7 because it’s the absence of those that really help me define and appreciate the rush of them. But this one sentence, to me, is both the same and yet antithetical to those moments as a profound and peaceful handle I can hold on to, a bridge between ineffable moments and the more routine ones of everyday life. Thank you, as always, for your insight and perspective. Judi, thanks for your comment. I like your description of the bridge between the ineffable moment and the more routine ones of everyday life. We wake up or become of aware of, in a new way, what is and has alway been there. Or, perhaps He is whispering and I am making too much of my own noise noise to hear Him. St. John of the Cross (I think) said God’s first language is silence. May his silence speak love and presence to you.